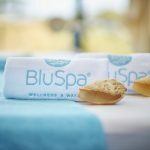 Albufeira offers a wide variety of fun things to do, and we compiled a list of the most exciting activities to try in Albufeira that are not in the 3-day guide. You can, with any trouble or hassle, switch any of the activities proposed on the guide for one of these, provided you account for the different distances, time spent, scheduling/planning and booking matters. Or maybe experience a fishing trip – Beach Fishing Tours. 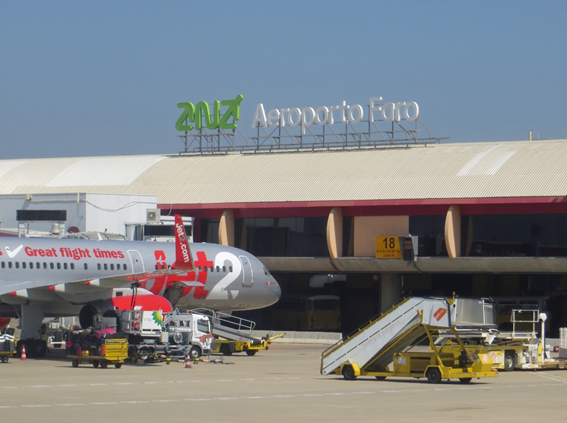 07:00am – Arrival at the Faro International Airport. 07:30am – Go get your bags and head to rental car service. The airport is relatively small, so this probably won’t take long. However, during peak months, there will be a lot of traffic in the airport so there may be more lines and people, thus increasing the waiting time. 08:30am – If you need, exchange your currency to Euros(€) at Unicâmbio. 09:00am – Get your car and get going. Head to Balaia Mar Hotel. 09:45am – Arrive at the Balaia Mar Hotel. Check in at the reception. Unpack your bags. 10:30am – Drive to Castle of Paderne. 11:00am – Arrive at Castle of Paderne. 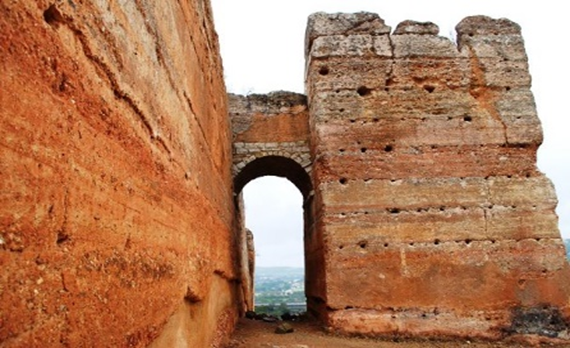 The Castle of Paderne is an ancient fortification located in Albufeira. It was constructed later in the 12th century. It is believed to be one of the original castles that occupy the shield of the Portuguese national flag. You can also walk around the Roman bridge nearby. 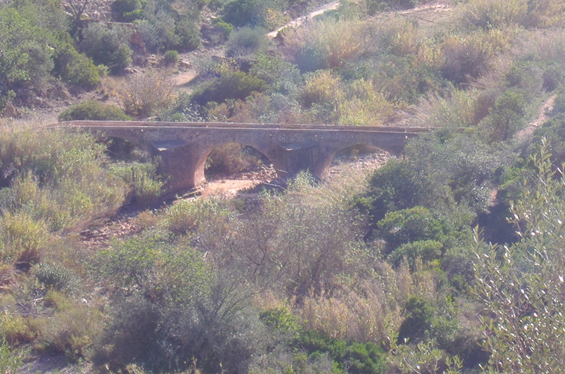 The Bridge of Paderne, also known as the “Roman Bridge,” is situated over the bank of Quarteira, in the immediacies of the Castle of Paderne, and was probably built to serve it. 12:30pm – Drive to the Restaurant Veneza. It has many parking spots over there. 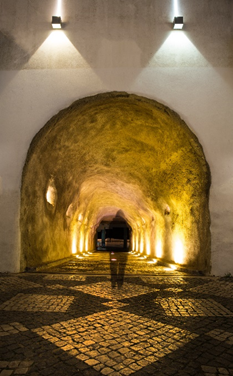 This restaurant has one of the best wine cellars in Portugal. 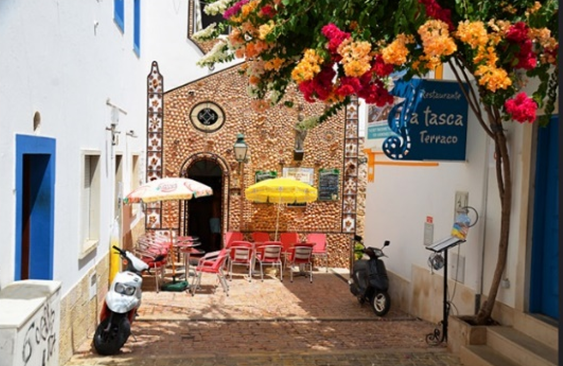 Accompanied by traditional Portuguese dishes, this place is a definitely a must! The meal is around 20€, no drinks included. The wine menu is varied and extended, so the price list has a wide range, but you can find very high-quality wines at a perfectly accessible price. 15:00pm – Drive to the Marine. It has a parking lot nearby. 15:30pm – Head up to X-Ride stand (or any other cruise service you end up choosing). Get ready to embark on a truly memorable ride. 16:00pm – Get up on the boat and start your cruise. 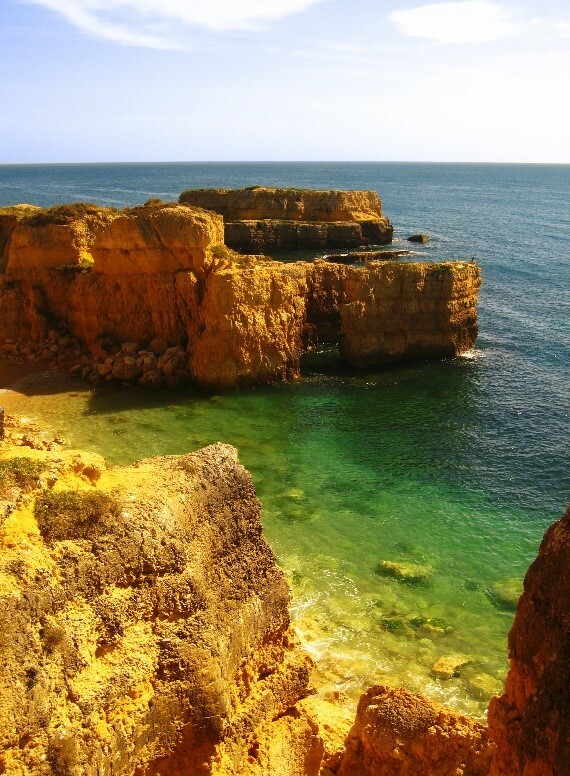 This ride will take through the beautiful Algarve’s coastline, passing by and stopping at beaches with peculiar rock formations, and luckily, be able to watch some dolphins. 18:30pm – Drive to the proximity of the Bullring and park there. 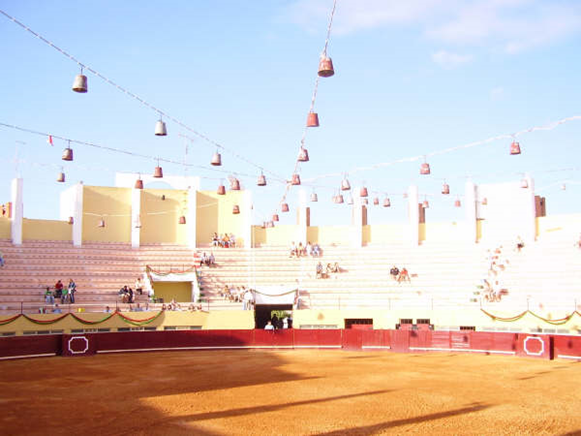 19:00pm – Walk around the Bullring and get to know that area. You are now in the New Town, with plenty of restaurants, shops, and fun things to do, see and buy. 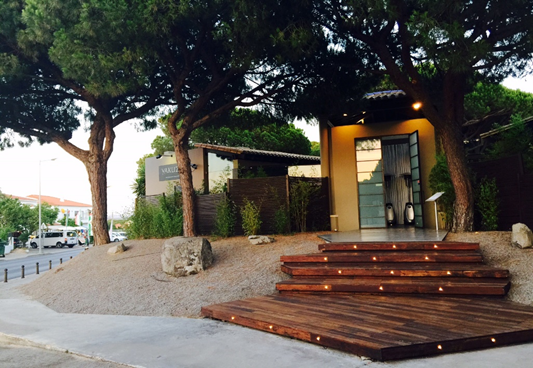 20:00pm – Walk up the street to the Restaurant Manel dos Frangos. 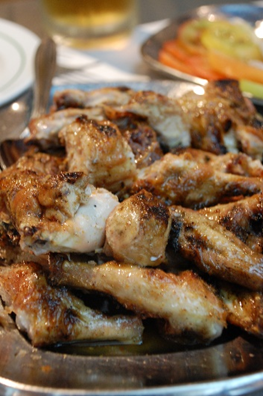 Try this traditional barbecue chicken, for which Albufeira is known for! The chicken is delicious and succulent, you’ll definitely like it! The meal will be around 20€, drinks included. This is the famous Strip. A road in the New Town, full of bars, people, and drinks, with frenetic neon signs all over. Here is where people from everywhere around the world go to a party, so watch out – sometimes, there is a lot of chaos and beer being thrown around! Drinks range at around 5-8€. 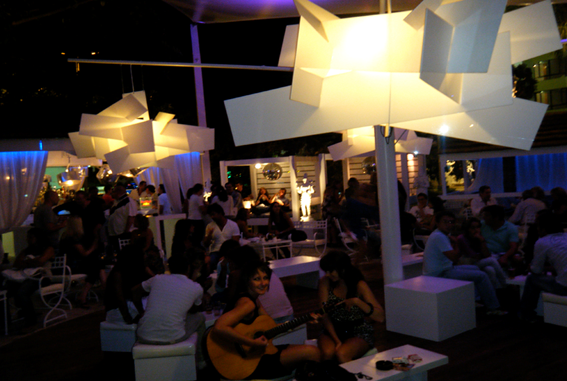 22:30pm – Have a drink at Lounge Bar Liberto’s. A classy and elegant lounge bar in the middle of the intense Strip. It is a place where you can sit down to have your drink, talk while listening to chill music. Somedays they host live shows. It also has a dancefloor, in case you want to bust a move! The drinks are a bit more expensive. You can drink a Gin&Tonic for 10€. 12:00am – Head to the Kiss club. A nightclub nearby. Don’t find it strange if when you get there at around midnight is still empty – in Portugal people usually tend to stay in the bars until they close – at 4am – and then head up to the clubs, and party until 7 or 8am. 03:00am – Go back to the Bullring where you parked the car, and drive back to the hotel. 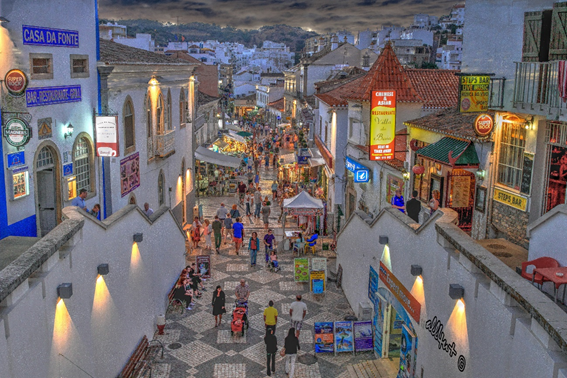 Below you can get the map of all the suggested activities for your first day in Albufeira. This map is accessible as a Google Maps format so that you can quickly zoom in and view it on any device, tablet, laptop or smartphone you might have. 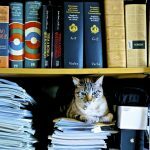 Just click on the photo or on the link below to access it. 09:00am – Enjoy your breakfast at the hotel. 10:00am – Drive to Evaristo beach. 10:30am – Park near Evaristo beach, in the parking lot. 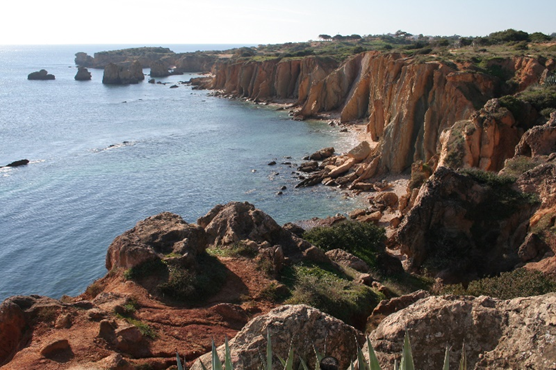 10:45am – Start your trip through the cliffs and the beautiful Portuguese coastline. Just head forward, instead of left to the beach and restaurant. Head to the cliffs and keep going. It will be a 2h/2h30 walk through the cliffs. But it will definitely be worth it. You’ll find things like that almost desert beach in the peak months of summer. Because they’re only accessible through the cliffs, most people, and all tourists, don’t know they even exist, or how to get there. You’ll be able to watch views just like these ones. 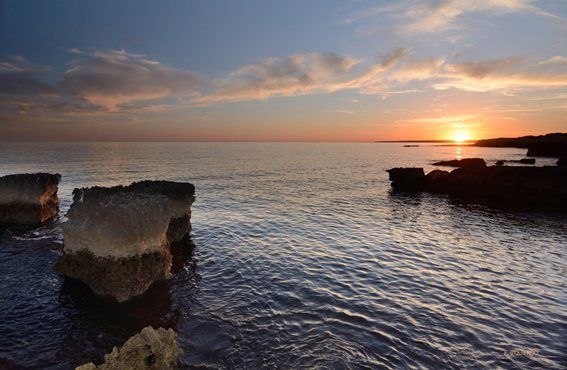 If you prefer, you can plan your day to watch the sunset from one of the breathtaking locations you will pass by. 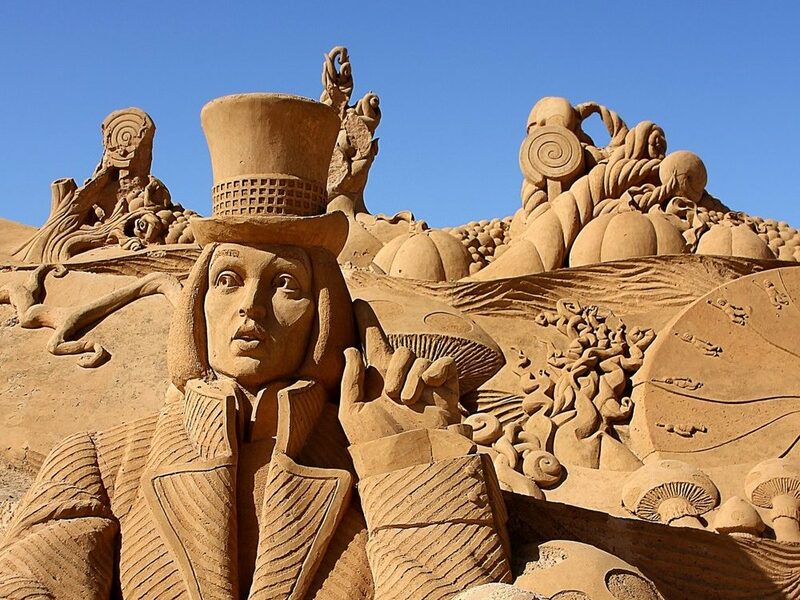 You’re are going to see the change in the scenery, sometimes seeing white, thin sand, other times facing a red and orange cliff, with sand that looks like dirt or mud. But the best of all might be the very private beaches you will encounter. There are several small beaches along the coastline, which will enable you to be at a beach completely alone. 12:30pm – Have a drink at the Vila Joya Bar right on the cliff. The prices will be a bit high, considering the view! 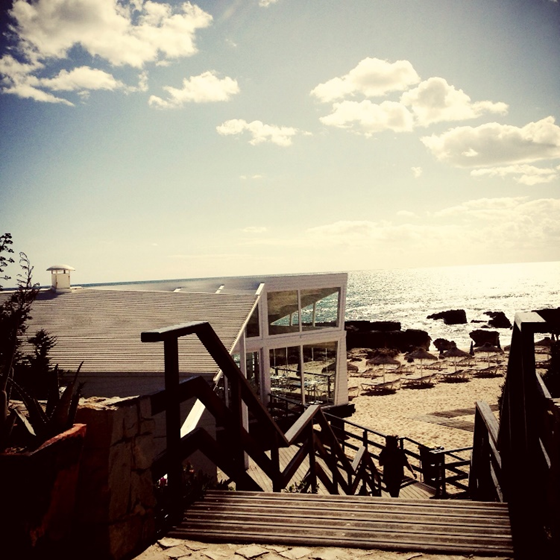 Then, make the same way back and have lunch at the trendy and fantastic beach restaurant, O Evaristo. This restaurant with a privileged location offers a wide range of fresh fish, seafood, and traditional Portuguese meals. They boast they don’t have a menu. 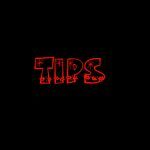 Waiters make suggestions, and the client follows! It is a very popular restaurant in Portugal. The meal is around 40€, drinks not included. 15:30pm – Drive back to the center and park the car at the big parking lot at Parque Lúdico. From there, walk to the center and see all it has to offer. The Old Town is absolutely beautiful. 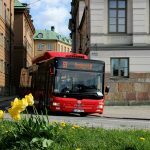 No need to make a perfect itinerary – the downtown is not that big, just lose yourself in it, go through the streets, to the highest points, enter the shops, and talk to the locals. 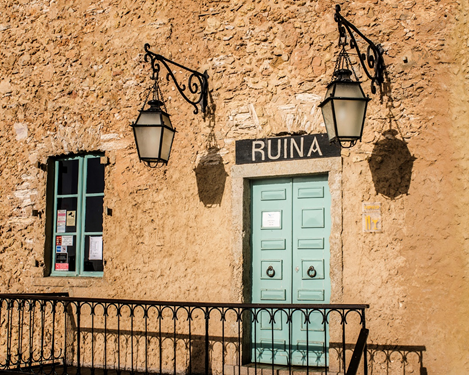 20:30pm – Have dinner at the beautiful restaurant A Ruína, meaning, in English, The Ruin. 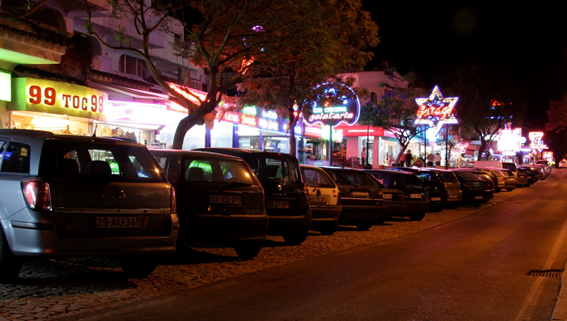 22:00pm – Nightlife in Albufeira is a truly remarkable experience. Roam around through the full streets of the Old Town. It has a little bit of everything. Bars for the older people and for the younger people. Places to sit down and talk, others just a dancefloor and loud music. You can find a British, Irish, Dutch, American, Portuguese, Italian restaurants on every corner. 23:00pm – Go and visit the Shisha bar A Casa do Cerro. It is right by the parking lot where you left the car. 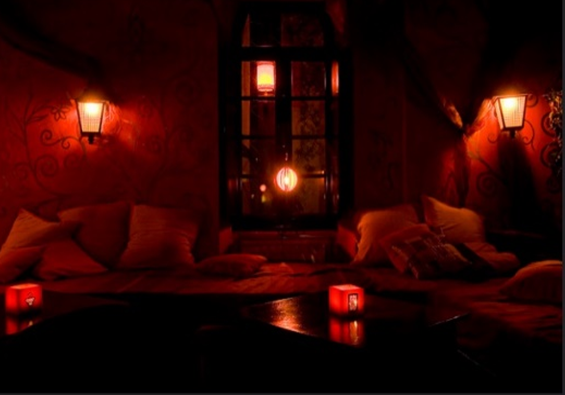 A more quiet and chill place, in A Casa do Cerro, you can have a drink, cocktail or tea, smoke a wide variety of flavored shisha and have a pleasant conversation, inside, sitting on very comfortable beds and chairs, or outside, feeling the cool breeze. 03:00am – Head back to the parking lot and return to the hotel. Below you can find the map with all the suggested places for your second day in Albufeira. 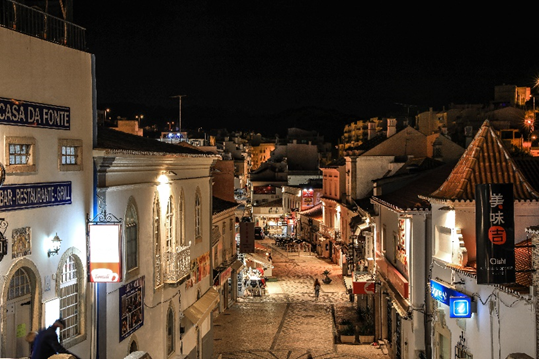 You can click on the link to see it in the online format of Google maps so that you can easily navigate when you are in Albufeira. 08:00am – Wake up and pack your bags. 09:00am – Enjoy your last breakfast at your hotel. 09:30am – Check out of the hotel. 10:00am – Drive to Falésia Beach. There is a parking lot there. There will be signs indicating the pathway to the beach. Falésia, in English Cliff, is a very particular beach. 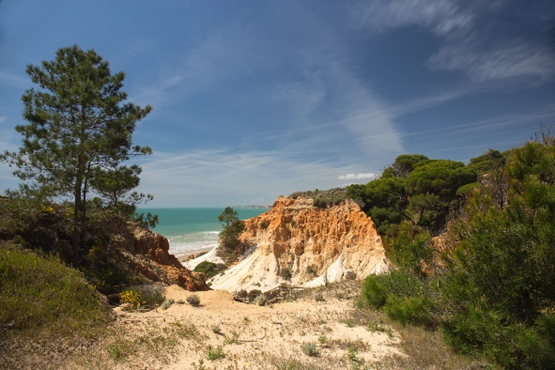 The view of the red cliffs is breathtaking and contrasts with the green of the pine groves above its dunes. The sand is soft and smooth, and in tones of red and white, due to the erosion of the rocks of the cliff. The beach extends for almost 7km, which is approximately 5miles. 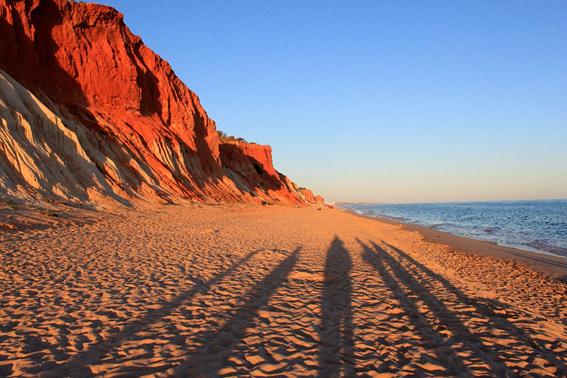 It connects Albufeira to Vilamoura, a city to the east of Albufeira. It is a vast beach with space for the large crowds, making it a perfect choice for the peak months of summer. 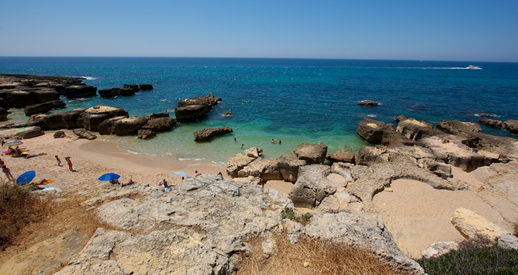 This beach has won several awards at European and World competitions for its incomparable beauty. 13:00pm – Lunch at the Yakuza Restaurant at the Sheraton Pine Cliffs Resort. Try this fusion cuisine restaurant presented by acclaimed cook Olivier. The concept is to mix the Japanese culture with the Mediterranean one. The result is absolutely fantastic. Plus, the view from the restaurant to the beach is stunning. It is also a great experience to go there just to watch the sunset and have a drink. The meal is around 35€/person, drinks included. Check out the website for the menu details and booking information. 15:30pm – Drive to Zoomarine. Certainly, you will not find any problem parking, since there is a huge parking lot right by the entrance gates. 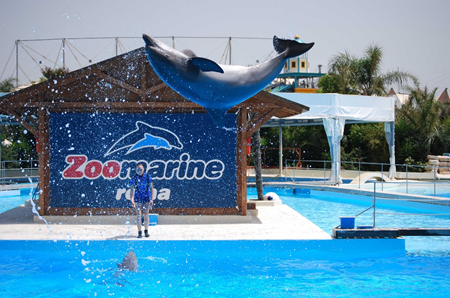 Zoomarine is water theme park, ranked the 7th best in Europe in its category. Perfect for families, it features several aquatic related shows with dolphins, sea-lions, and seals, as well as many other attractions. There are many activities for you to enjoy in this theme park. You should definitely wear sports or casual clothes, sun hat, comfortable shoes and sunblock. The prices depend on the activities chosen, number of people, age, and some other factors. For full information on ticket prices, availability of group visits, discounts, activities and more, check out the website. 20:15pm – Have dinner at the restaurant Ramires. It was in this traditional restaurant that the original recipe was created, by the hands of the man Ramires himself. It is said to be the best Franguinho da Guia in the world. Now, you are able to compare it with the Guia Barbecue Chicken you had in the restaurant you were on the first day. Which one do you think is better? In July and August, this restaurant does not accept reservations, so be there early, since it is a trendy place among locals and it might have a long waiting list, despite being a large restaurant. During the other months of the year, you can book a table online or call the number displayed on the website. The meal is around 25€/person, drinks included. 21:30pm – Drive to the Faro Airport. 22:10pm – Leave the car at the respective rental stand. 12:00am – Departure from Faro Airport. 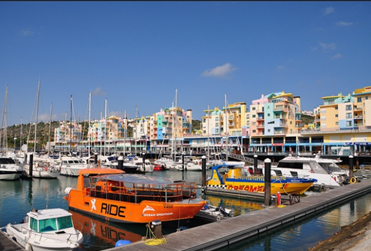 Here is the information on the best tours to book while you are in Albufeira. The best site to book your tours and get some decent discounts is Get Your Guide. Tip: Don’t forget to take a bottle of water, a hat, fresh and loose clothes, comfortable shoes, sunscreen and, of course, a camera, if you do this in the summer.